Spardha, an Independent Film is creating Positive Vibes in Internet History with its unique Concept in Youtube. iMovie Junction is proudly presenting this Independent Film. Earlier, iMovie Junction has also showcased Madhuram Independent film which happens to be the most searched independent film in web. Madhuram is being directed by Phanindra Narsetti. This independent film is based on Mixed Martial Arts (MMA). Writer and Director Niroop Kumar has given its final touches with his narration and V R Kanneganti has produced this independent film under Kanneganti Pictures and Abandoned Creations. Shree, Kumar Nirmala Srujan are seen in main leads. Shravan B is the music composer and Parvaez K has taken care of Cinematography. 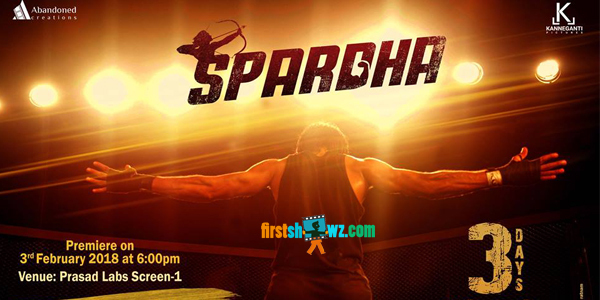 Spardha Team has announced its Preview Screening date on February 3 at 6PM in Prasad Labs. This Independent Film Spardha gets an unianimous support from Arjun Reddy fame Vijay Deverakonda and Creative Director Sukumar.